Is your dog scared of thunder? Photography ©hidako | Thinkstock. My dog Grant is scared of thunder. Like many dogs who struggle with unexplained fear of thunder, Grant seems unusually sensitive to any storm-related occurrence, such as changes in barometric pressure. Once the rumbles begin, his anxiety rapidly escalates into overwhelming terror. So, for us, it’s especially unfortunate that summer’s humid conditions can produce some of the biggest storms of the year. A dog scared of thunder can result in hiding, urinating, excessive panting, drooling, trembling, whining, eye-rolling and/or frantic efforts to escape. If you’re Grant, they include all of the above … and some of his escape efforts have led to painful injury. The cruel irony is that if we, as owners, fawn over Grant or try to over-comfort him, we’re essentially reinforcing his panic behavior. A dog often interprets this pronounced reassurance as confirmation that the event taking place truly is worthy of panic. 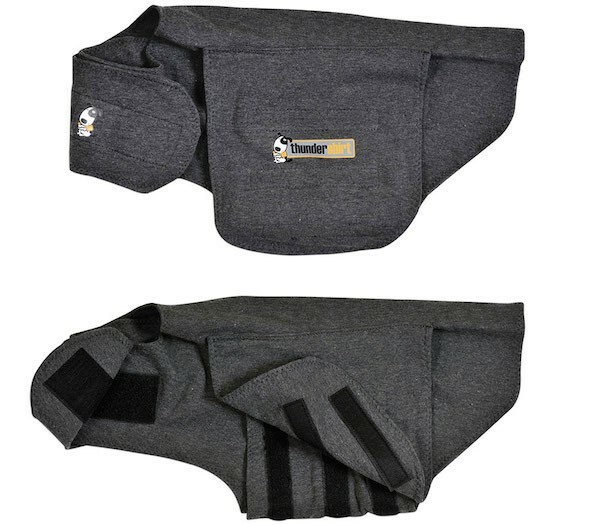 Manufacturers of the Thundershirt claim an 80% success rate when it comes to calming fearful canines. Photography by Marybeth Bittel. Grant exhibits a fairly intense fear response when it comes to thunderstorms. The good news is we’ve managed to help him cope without resorting to the use of pharmaceuticals. If none of these approaches work for you, have a candid conversation with your vet. In extreme cases, there are medications that can help keep your pup comfortable. But take a cue from Grant — a little dedication and ingenuity from you may be all that’s necessary to help your canine cope successfully! 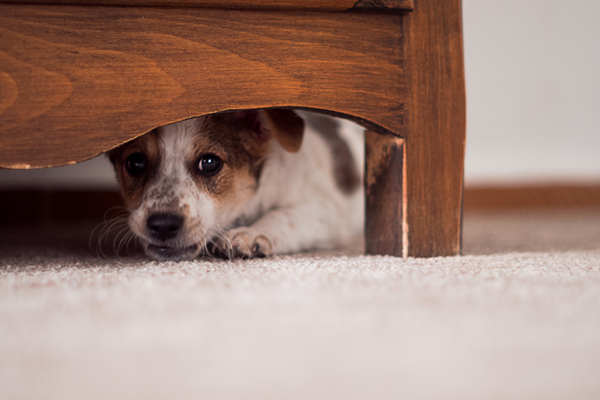 Tell us: Is your dog scared of thunder? How do you cope? What are your tips? Thumbnail: Photography © garybis | iStock / Getty Images Plus. About the author: Marybeth Bittel is a freelance writer who lives in the Midwest with her wonderful husband, her crazy rescue dog Grant, and her level-headed rescue dog Maizy – all of them Heinz 57 mixed-breed types. Marybeth identifies as mostly Italian, so she enjoys feeding family, friends and furkids almost as much as Grant and Maizy enjoy eating. She’s also a marketing communications consultant and former marketing/PR exec. Connect with her on LinkedIn or — to see her latest pet pics (and be careful what you wish for here) — check out her family Instagram feed. This piece was originally published on August 10, 2015.